Last night was the night Samsung finally spilled the beans on a bunch of products we already knew everything about, plus a couple we weren't that familiar with. All in all, there were nine devices on show, and for those of you who missed all the news last night let's run through everything that happened. Not the Galaxy X, or even the Galaxy Flex. Samsung's foldable phone is called the Galaxy Fold, which is nothing if not accurate. This device is a 2-in-1, functioning as both a 4.6-inch smartphone and a 7.3-inch tablet in its folded and unfolded modes. There are six cameras spread across the phone (one on the front, three on the back, and two on the inside) which are supposed to cover every possible angle, and ensure you're able to capture images without needed to alter the configuration of the device. Sadly the interior cameras come in what we're stubbornly calling an emo notch, because it looks like an emo kid's fringe. Other specs include a side-fingerprint scanner (no fancy in-display tech here), Android's app continuity that lets you continue using apps in both screen configurations, triple-app multitasking in tablet mode, 12GB of RAM, and 512GB of storage – though so far it doesn't look as though there's a microSD card slot. The battery is also somewhere around 4,400 mAh, split across both sides of the phone to ensure everything is balanced properly. The bad news? UK prices will start at around £1,800 for the 4G version, and there's no headphone jack. If it's any consolation, though, Samsung is offsetting those issues by including a free pair of Galaxy Buds with every Galaxy Fold, alongside a protective kevlar case and Samsung Care+. The number of devices will also be limited, though Samsung wouldn't say how many it was making. The Galaxy Fold arrives in Europe on 3rd May, in Cosmos Black, Space Silver, Martian Green, and Astro Blue. The hinge colour will also be customisable, but details on that are still scarce. Pretty much everything mentioned in the leaks were true, and we have three brand new Galaxy S10 devices hitting the market on 8th March (pre-orders are open now). There's a lot of choice this time around, with prices for the more-compact Galaxy S10e at just £669 for a device with 6GB of RAM and 128GB of storage. The standard S10 ranges from £799 to £999, and the S10+ ranges from £899 for the base model up to £1,399 for the 1TB 'Ultimate Performance Edition'. So it can get pretty pricey, and Samsung admitted there was still demand for a more compact device like the S10e which is why it's here. Apparently the S10e is designed for people who have been rocking the S7 or S8 and want to upgrade, while the S10 is more for the people who are already thinking about swapping their S9s. There's not much to say quickly about the S10 range, other than the fact it's a very incremental update from the S9. But you can check out the full specs over here. One of the few surprises of the night. We knew Samsung was working on 5G devices, we just didn't know what they would entail, and whether they would actually come to the UK anytime soon. As it turns out, the phone is another Galaxy S10, albeit slightly bigger and fancier than the other phones. The S10 5G is obviously 5G compatible, has a bigger screen, a bigger battery, 25W fast charging, and 3D-sensing cameras on the front and back. Sadly those cameras don't offer 3D facial recognition, but Samsung has promised they're going to be very helpful for realistic 5G-powered augmented realty work. We'll have to see what that's like when it launches. We don't know pricing details yet, or any release information beyond a fairly vague "early summer". But we do know it will be arriving in the UK via both EE and Vodafone, networks that have promised to have commercial 5G services up and running before the end of the year. You can read more about the phone here. Following up last year's Gear IconX earbuds, Samsung has a new set of wire-free earpieces that have fully embraced the Galaxy brand - just like the phones. Promising to be 30 per cent smaller than its predecessor, with adaptive dual microphones to ensure you get the best possible sound, it really seems as though Samsung is trying to one-up Apple's Airpods. The Galaxy Buds cost £130, are available in white, grey, or canary yellow, and have had their sound tuned by Samsung-owned AKG. They also have personal assistant support, support wireless charging through the case, and supposedly have enough juice to last up to six hours of music and five hours of talk time. The case itself has enough power to recharge the buds in full an extra two times. People like phones a lot more than they like smartwatches and fitness trackers, but there's still enough demand to warrant Samsung's attention. 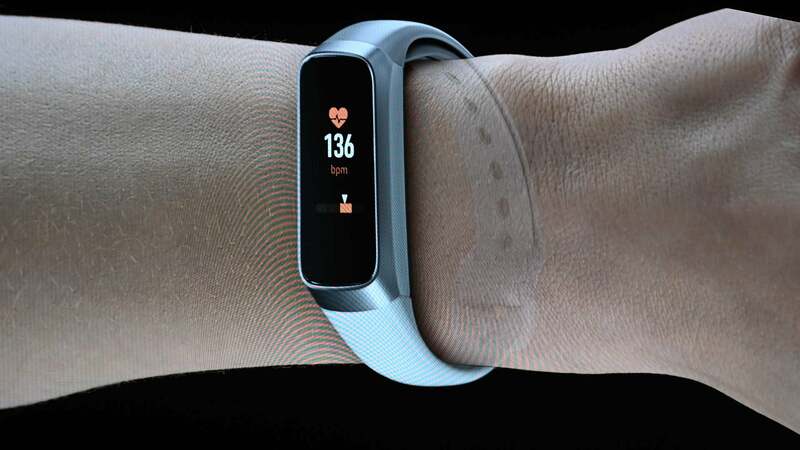 It had three new wearable devices to show off last night in the form of the Galaxy Watch Active smartwatch, the Galaxy Fit fitness tracker, and the Galaxy Fit e. That's also a fitness tracker, but not nearly as nice a tracker as the more expensive Fit. The Watch Active is an incremental upgrade from last year's Galaxy Watch, with the same focus on fitness and wellness as before. The differences are that it has a blood pressure monitor hidden away, and lacks the rotating bezel Samsung watches have used for navigation in days gone by. It costs £229, comes out on 20th March in the UK, and pre-ordering from Samsung gets you a free wireless charging battery pack. You can read more here. The Galaxy Fit is your standard fitness tracker with standard fitness tracker features. It has a heart rate monitor, step counter, automatic recognition for six exercises, has a week-long battery life, and is waterproof up to 50 metres. Samsung has confirmed it'll cost £89 and will come out in the UK on 21st May. Details on the Fit e are a little scarcer, but it offers much of the same functionality for a lower £35 pricetag. The differences are that it's smaller and lighter, coming with a smaller screen and battery as a result. It also doesn't have the same gyroscope as the Fit, which means its tracking isn't going to be exactly the same. Sadly there's no word on when you'll be able to buy one just yet.